A number of M&A transactions have taken place in the car rental industry over the last decade, largely driven by the American majors Avis Budget, Enterprise and Hertz. A deal rationale frequently communicated is to be able to offer a more adapted solution to different clients, i.e. improved segmentation, through a portfolio of brands. To what degree can the strategic rationale be considered to have held up? And is a multi-brand approach, the most frequently used strategy to improve client segmentation in car rental, value creative to shareholders? There are other segments as well, including vans & trucks, insurance replacement business and car sharing, which are all mainly sub-segments in the off-airport business. For the sake of simplicity and clarity, these are considered out of scope in this context and have not been included in the analysis. The idea behind this approach and categorization is that as clients are different, one should offer various products and services to cater to specific needs. The corollary is that a one size fits all approach, e.g. a single brand, may not be the best and most appropriate approach to cater to a diverse client base. This is neither a novel idea nor specific to the car rental industry; the aviation industry has gone through the same development over the last couple of decades, with the growth of the low cost carriers. Of the five major, global car rental operators, four operate a portfolio of brands covering various market segments (car sharing excluded).  Running a multi-brand portfolio comprising everything from premium to deep value is not a straightforward task, as seen in the airline industry where most attempts by legacy carriers to launch low cost brands have experienced limited, if any, success. European examples include Go, launched by British Airways, which was sold to its management due to poor performance before falling into the hands of Easyjet, and Snowflake, a subsidiary of Scandinavian Airlines, launched early 2003 and closed during 2004, the main reason being operational challenges from being part of a legacy airline. A major issue with regards to good execution of a multi-brand strategy is cultural, e.g. basing deep-value operations on staff with “premium” experience in a “deep-value” offering or vice versa, may prove to be operationally challenging as the mindset is different. Recent examples include the struggles experienced by Air-France-KLM when looking to use a low cost service, Transavia, rather than its “premium” Air France service on internal European flights and Lufthansa rolling out Eurowings as a budget airline. As with any strategic choice, pursuing a multi-brand strategy is done with the objective of creating as much value as possible for both shareholders and other stakeholders. Is there any evidence that this is the case? Two proxies for success have been considered, being the pretax margin (ideally operating margin, as it does not include the impact of capital structure, would have been used, but based on available data and to ensure as much of a like for like comparison as possible, pretax was chosen) and share price development. The pretax margin for the period 2010 – 2015 of the four listed major car rental operators as well as the leading European independent, low the deep value brand operator Goldcar from Spain, has been compared. 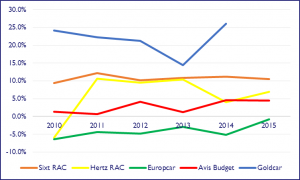 For Avis Budget and Europcar consolidated numbers were used whereas for Sixt and Hertz only the car rental activity and corresponding results are shown, excluding all other activities (e.g. leasing for Sixt, equipment rental and Donlen for Hertz). Also, for comparative reasons reported, not adjusted, pretax has been used. Interestingly Goldcar have seen the best margins throughout the period (2015 figures not available). Of the major operators, Sixt has seen its pretax margin hold steady in the 10-11% range with a gradual margin improvement for both Europcar and Avis Budget. Hertz has seen a somewhat erratic development throughout the period and, interestingly, has so far not seen any meaningful improvement in margins since it closed its acquisition of Dollar Thrifty late 2012 (the company did have some serious internal issues to deal with during 2014 and 2015, which impacted results negatively in those years). While margins are obviously not purely a consequence of segment mix and a single versus multi-brand approach, it serves as a proxy for company performance. One also has to acknowledge that companies, while being impacted by broad, market specific macroeconomic cycles and issues, also go through phases where internal issues may play a role, e.g. the recent Hertz accounting restatements. Nevertheless, the above comparison of pretax margin represents circumstantial evidence that a multi-brand strategy as an approach to segmentation in car rental does not necessarily generate superior performance and margins. How do financial investors look upon the different car rental operators? The below chart summarizes the 5 year share price performance of Avis Budget, Hertz and Sixt, indexed in USD (Europcar was only listed mid-2015). 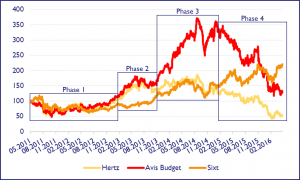 Phase 2: Avis Budget and Hertz move in tandem, Sixt underperforms. The share price development is obviously not a consequence of the success of one specific strategic decision made. There are, however, a couple of interesting observations. First, Avis Budget and Hertz decoupled in a positive manner from Sixt at the time of the Hertz/ Dollar Thrifty transaction, which was followed by the Avis Budget acquisition of Payless (a deep value brand) some months later. This suggests that the market did believe that better segmentation through a multi-brand approach would be value creative. Second, over the last approximately 18 months Sixt shares have moved steadily upwards whereas Avis Budget and Hertz shares have been more or less in freefall. Hertz has had internal issues to deal with during this period, but soft pricing in the US has been a major issue for both companies recently. Thus, what one has seen is that a multi-brand strategy does not necessarily make operations more robust during soft market conditions. 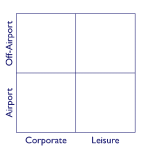 Whereas a multi-brand approach is often highlighted as a key strategy in corporate presentations and presented as a key rationale for M&A activity, the actual merit of such a strategy versus a single-brand approach does not seem clear cut when one considers actual performance, measured either in pretax margins (realized or improvement) or in shareholder returns. While acknowledging that the data and findings above are high-level and probably not conclusive, there seems to be circumstantial evidence available to suggest that a multi-brand approach to dealing with segmentation in car rental may not necessarily improve performance or create shareholder value. Reasons for this could be cultural, e.g. an inappropriate mindset to deliver a low cost/ value product in a “premium” focused organization, as well as a focus on multiple brands and segments possibly spreading resources out too thinly. Nicolay Nedrelid is Founder & Corporate advisor at Nedrelid Corporate Advisory, a strategy and strategic planning consulting boutique based in Geneva, Switzerland.